Infected lawns showing spread consistent with mower tire patterns. The new SCMV appears to be a combination of two viruses. A definitive test is still being developed for the second virus; it is not known when or how this virus entered the state. To date, this new SCMV combination virus has not been found on sod farms within the state. The virus is known to spread on equipment such as mowers, string trimmers, and even boots and gloves through sap from cut grass and through clippings moved from one lawn/landscape area to another. The virus can cause lethal necrosis and death in Floratam St. Augustine. Other St. Augustine types can be infected, but don’t appear to die off. Early research noted that Palmetto St. Augustine and Bitter Blue St. Augustine were more tolerant; ongoing research indicates that other St. Augustines may also be tolerant. Zoysiagrass does not appear to be a host. In 2011, a turf care professional in Pinellas County (Tampa area) reported mosaic symptoms on Floratam lawns which progressed rapidly in the fall, resulting in severe dieback and eventually, death of the impacted areas. Even more puzzling: areas re-sodded with Floratam St. Augustine died again the following fall. 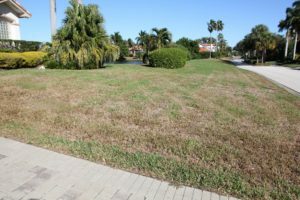 In 2013, extension agents in the Palm Beach County began receiving reports of similar incidents: lawn areas that exhibited typical mosaic symptoms, but which declined rapidly in the fall and died. As with the Tampa-area cases, turf areas resodded with Floratam St. Augustine typically died the following year, regardless of management strategies. By 2015, it had become a significant problem in residential communities in West Palm Beach. While the symptoms of these outbreaks were similar to another viral disease – St. Augustine Decline, or SAD, which exists in Texas but has not been reported in Florida – samples tested were negative for the virus known to cause SAD. However, they did reveal something surprising: the presence of a second distinct virus, in addition to the typical causal agent of mosaic disease. This second panicovirus had only recently been identified in bermudagrass and reported in journal of the Dean for Research, Dr. Harmon and other UF researchers sequenced the genomes from samples of infected and non-infected grasses to identify this second virus and have concluded that it is the panicovirus strain found in bermudagrass. All of the infected Florida samples exhibiting lethal necrosis have tested positive for both the original SCMV potyvirus and panicovirus. The source of this virus and how it was introduced into Florida is not known at this time. Another factor unique to the virus is that it appears to have a temperature trigger. Decline typically begins in September-October, or when temperatures fall below 65 degrees Fahrenheit, which is consistent with results from greenhouse testing. Floratam St. Augustine seems to be the most severely impacted; other St. Augustine cultivars may exhibit symptoms but do not appear to develop severe necrosis. The majority of cases reported to the UF Rapid Turf Diagnostic Service as of January 2018 were in the Palm Beach County area. Samples have tested positive in neighboring counties, including Martin, Indian River, and Miami-Dade and Broward Counties. At least two instances have been report in north Florida (Columbia and Clay Counties), but these were not as severe as those in southern Florida nor as widespread. Patterns of spread within infected areas indicate that the virus is being spread from lawn to lawn by mowers, trimmers and other equipment through clippings and sap. To date, no infections have been found on sod farms; it does not appear that the infections have originated from the farm level. Lawn care companies are being advised to allow equipment to dry between jobs; to remove clippings from equipment and leave them in place (no transport), and/or to fully decontaminate equipment between job sites to avoid carrying the virus from one area to another (this includes boots or gloves that could harbor sap). It’s also recommended that clippings not be removed from infected properties. At present, there is no effective treatment for the virus. Lawns replaced with Floratam St. Augustine have typically died in the fall, so replacement with alternate cultivars or varieties is recommended. At the recent TPF Regional Meeting, Dr. Harmon noted that Palmetto and Bitter Blue are referenced in the EDIS publication “Mosaic Disease of St. Augustinegrass Caused by Sugarcane Mosaic Virus” as potential alternatives. In early observations, lawns replanted with these two cultivars survived (they may develop symptoms but did not experience the lethal necrosis associated with Floratam). However, additional testing has indicated that other St. Augustine cultivars may also be tolerant and be acceptable replacements. Educating your employees. Make sure your employees (or at the least, your job foreman) understand the threat and have accurate information about it. Establishing a protocol for decontamination of equipment between jobs and/or before returning to the farm (don’t forget about boots, gloves, and pallets). Determine the best way to dispose of rip-out material to avoid spreading it to other sites or worse, to your production fields. Consider limiting customer traffic to your fields, especially if they are working in areas of known infection.